These three makeup brushes help you create the latest eye looks. 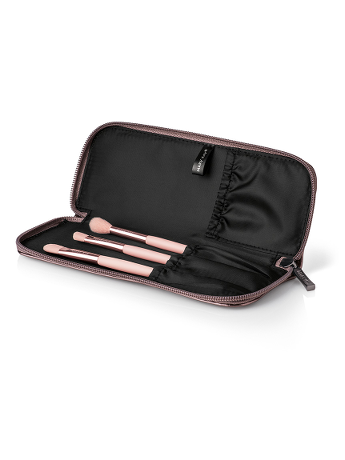 The set includes an eye blender brush, an angled eye crease brush and a wider eye colour brush plus a beautiful rose gold-tone bag. Each brush in the makeup brush set features synthetic bristles. New technology makes the bristles in these makeup tools perfect for both powder and cream eye color formulas. This eye brush set makes a great holiday gift, stocking stuffer or gift for the fall/winter bride. ‘Tis the season to sparkle and shine! While the Eye Brush Set is ideal to include in your beauty wardrobe, it’s the perfect gift for the makeup enthusiast on your holiday list! And the gorgeous metallic bag that houses the brush set allows for elegant gift-giving during a season marked by luxury and indulgence.